Soon after doing the Subway for the first time in the late 90s, I recall reading with intrigue route descriptions of what seemed like a far away mystery of the other, less known, less traveled fork of North Creek. 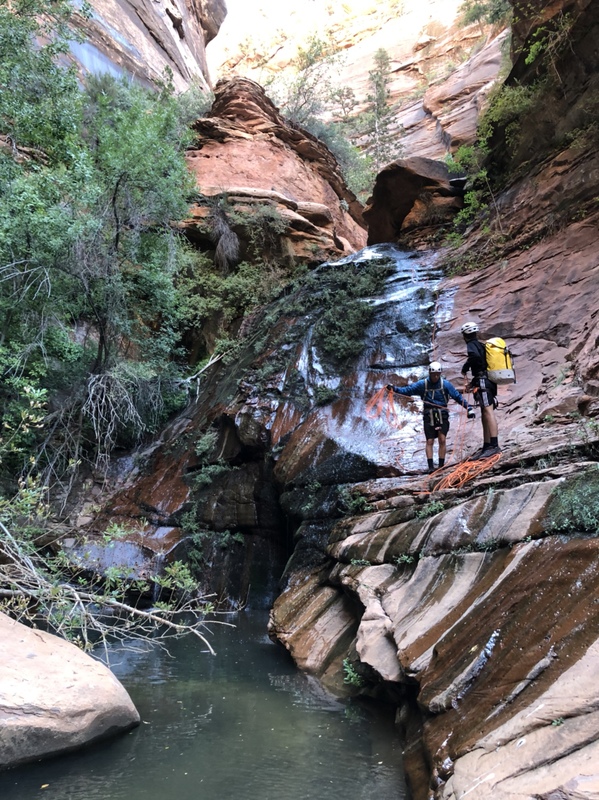 My information came from a book (can't recall reference), but the tale was a description of challenging potholes, the need for an air mattress to transport gear across the cold black pool and mention of amazing spots like barrier falls, double falls, and the beauty and solitude of the Grand Alcove. It all seemed so far away - and sort of out of reach. I didn't have the gear, I didn't have much know how and didn't know anyone who would join me for such an adventure. 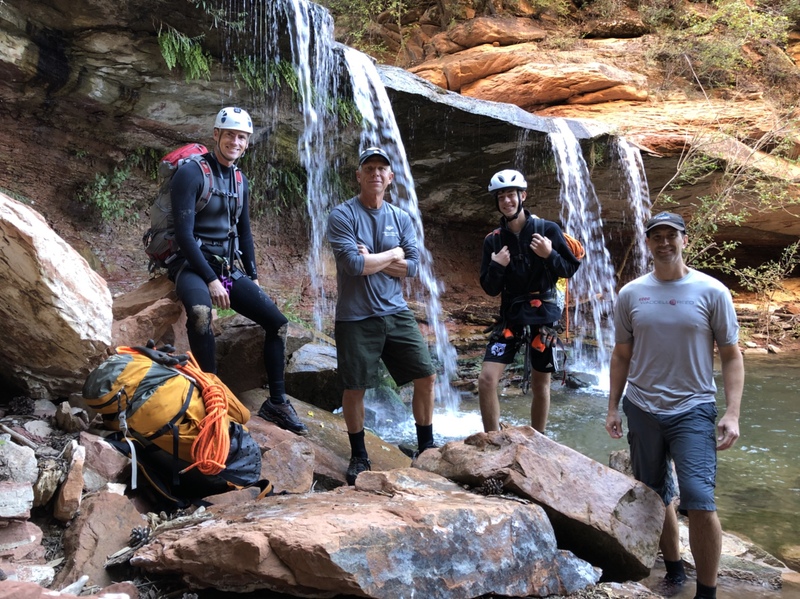 After nearly 2 decades, I finally got the right team and the right weather conditions and thoroughly enjoyed a 2 day adventure through the Right Fork 9/10 and 9/11. 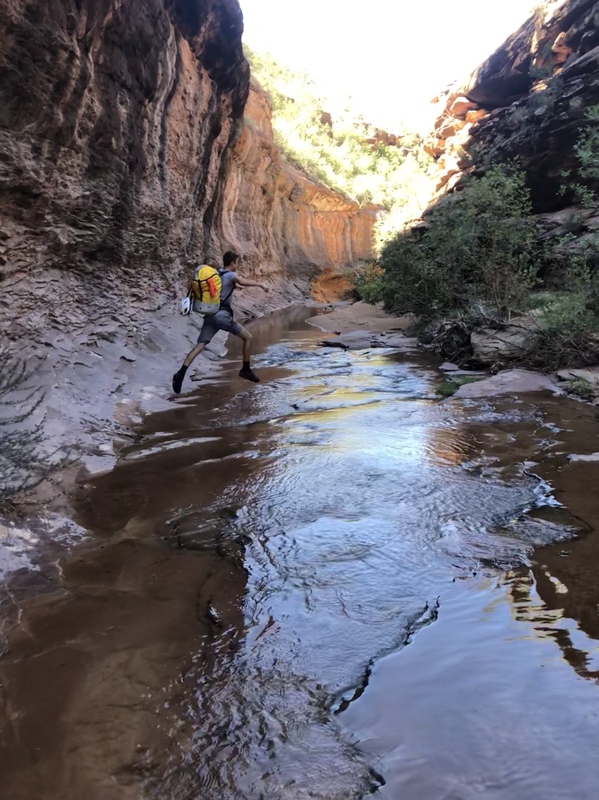 I only get out from Kansas City to go canyoneering 3-4 times a year and have a preference for 1 day canyons, but for us this time, taking the extra overnight gear was worth the trip. 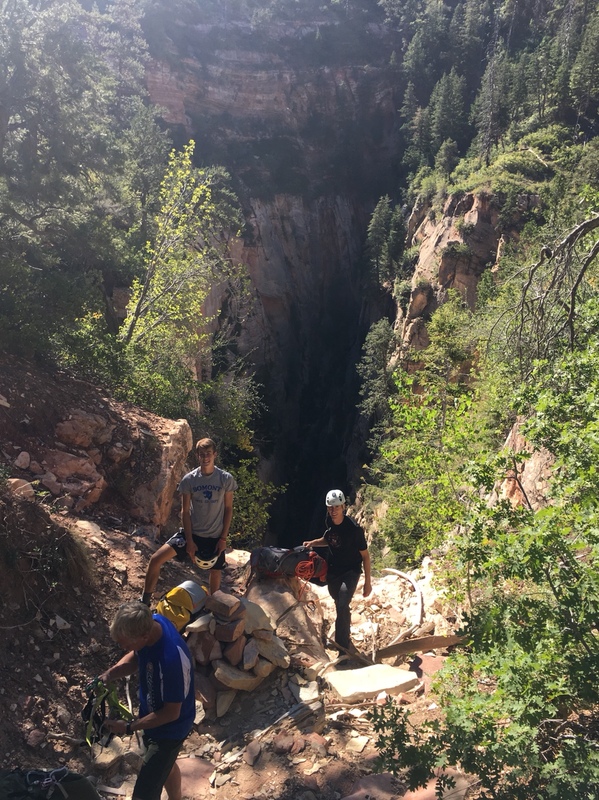 Our team of four, 3 experienced and 1 somewhat newbie (my 16 year-old son Charlie) took 3 ropes (200ft, 100ft, 50ft) and 50 ft of webbing. We also hefted 4/3 wetsuits and sleeping bags, pads (no tents). I don't think anyone's pack was over 30 lb. We did a car shuttle, leaving one at Right Fork Trailhead and the second at lava point. Left STG about 6:20 am and started hiking just before 8 am. 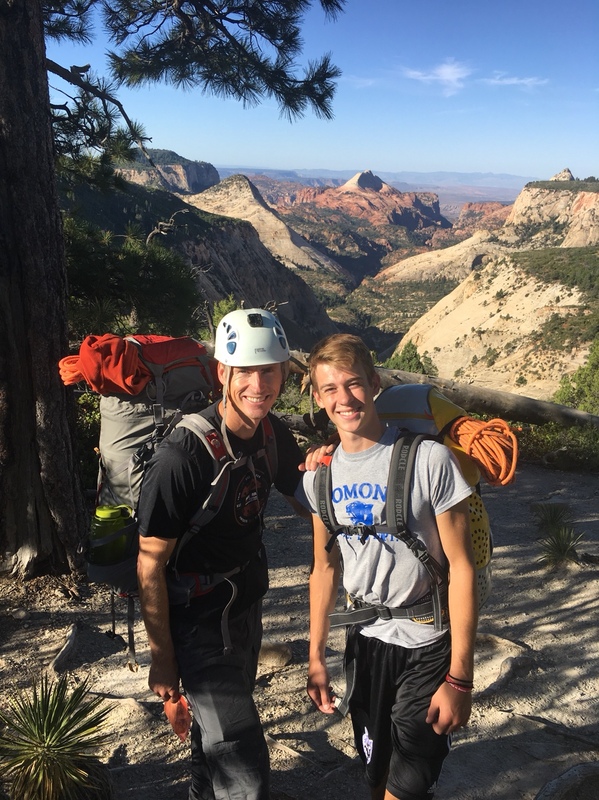 After 2 blister repair/prevention stops, some bushwhacking towards hammerhead, we began 1st rappel at 11 am. From the ridge looking into hammerhead, its about 10-15 min down climb on the north side of the drainage to reach the 1st rap. No bolts in this section - all off natural anchors. 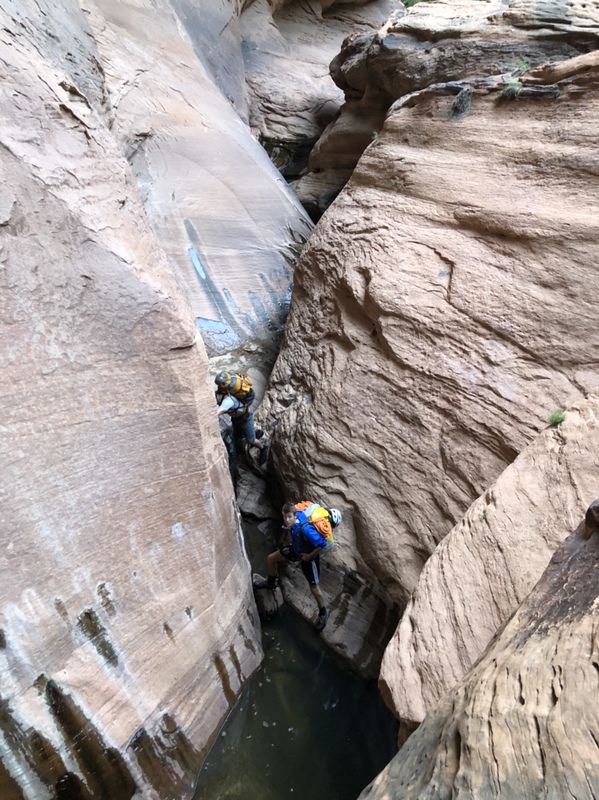 It's a little sketch going over free hang for 165 ft off a pile of rocks.... About 5 or 6 raps in this section, several include awkward starts, no water or pools. Canyon is deep and while not a tight slot, quite vertical. Finished hammerhead section about 12:15 am. Break for 30 min, arrived at potholes 1:45 pm. Routed around several and suited up at 2:20 for narrow slot (direct section). We filtered water in these first pools. Having seen the whole route, I don't think I would ever choose to do Right Fork and bypass the potholes section. It was fantastic. 2 hours of up and down, twisting, curvy. Had elements of Imlay, Heaps, Checkerboard (if it had water). Don't underestimate the challenge if pots are shallow, could be some real extra work, but we didn't have those conditions. Finished that section and made the hard right turn at 4:30. We had one mishap. Somehow during the direct section we left the 100ft orange rope. Luckily it wasn't a critical error, but was unfortunate. If a group comes through and collects, we would be very grateful if we could arrange a return. 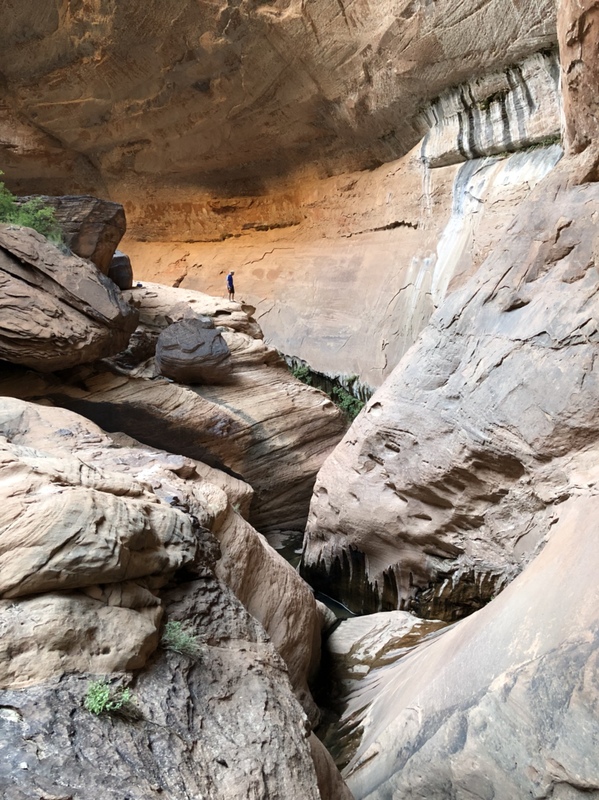 If we had more time, we would have explored the slot longer at the hard right turn, looks like a very fun canyon itself - just went up it 5 min or so. Within 15-20 min of that area we were in the black pool. Very fun swim with some wading in the middle and capped of with a mini Imlay-like star wars section, but quite easy in comparison. Water levels in most potholes were close to full if not 1ft or so below the lip. A few partner assists, but nothing in hard mode. 5-6 raps in potholes and a couple more after the black pool. There are a couple more raps after black pool, one with a bolt RDC into swimmer section. Could remove wetsuit after that rap. We made it to Grand Alcove by 6 pm. Was a delightful place. Weather was perfect for sleeping out. Nice water to filter and decent area to spread out. Next morning we left about 8:30. 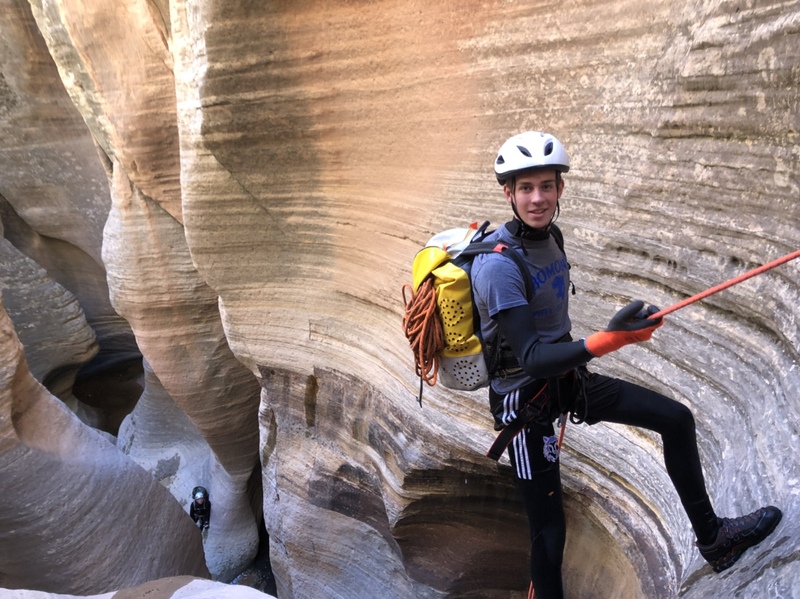 There is an 80 ft rap just beyond the alcove to exit, but we took the watercourse. Only 1 of us put on wetsuits and we had some waist level water. 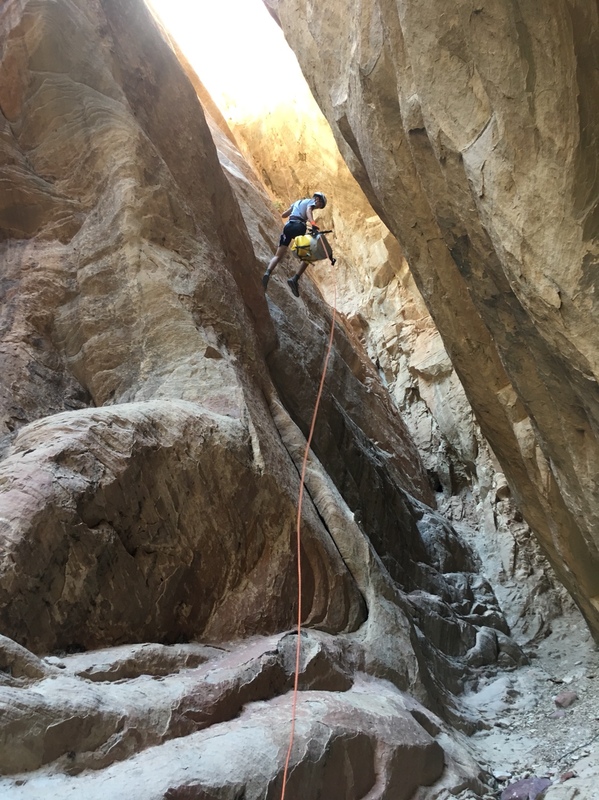 A couple spicy downclimbs, mostly because it is slippery in spots. What a beautiful place. Almost immediately barrier falls is around the corner, where we replaced the webbing. 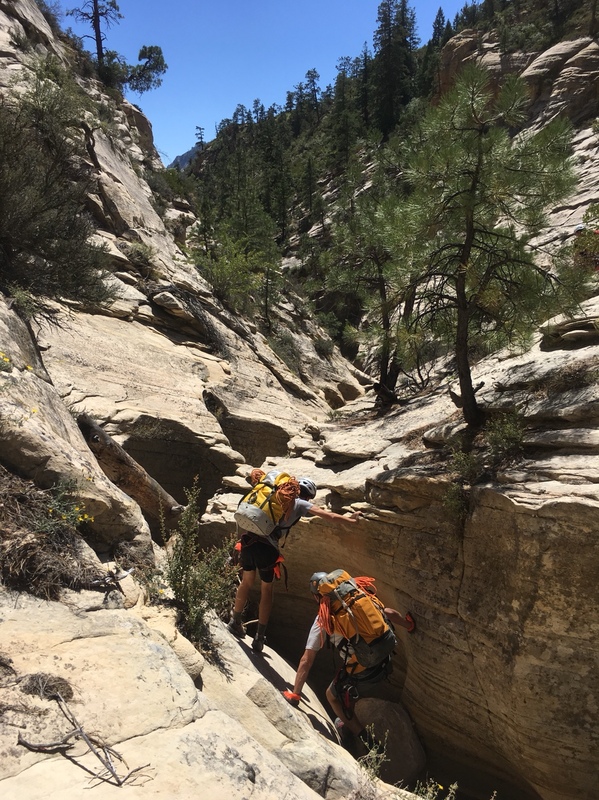 The ensuing sections are huge boulder fields and interesting route finding down the canyon. By 10 am we were at double falls. We spent 45 min or so enjoying the scenery, some jumping, some making the small rap, taking pictures and changing. We prepped for the hike out and left the area around 11 am. We split into 2 teams, with the lead team agreeing to move faster and perform the hour car shuttle. The 1st group was very fast making back to trailhead at 1:30 and back with car at 2:30. The second group took some sweet time, laying in the pools in the heat of the day before making the 30 min climb out through the lava field and arriving back at 3 pm. Ooops, sorry to keep you waiting boys! RF is not your typical canyon because of its length and variation in terrain. I can see the appeal of doing it in one day but I don't see how you would enjoy the last half - easily becoming at 16-18hr slog especially losing momentum in the last few miles. It is some trudgery. The fires 13 years ago in the bottom section of RF made this place look and feel like a barren wasteland. I can see the appeal of the 3 day - leisure adventure some mention. For us, 2 days was perfect. Day 1 a little on the long side but so worth it. With many good choices of canyons in the area, RF is a worthy contender with the right planning and schedule. 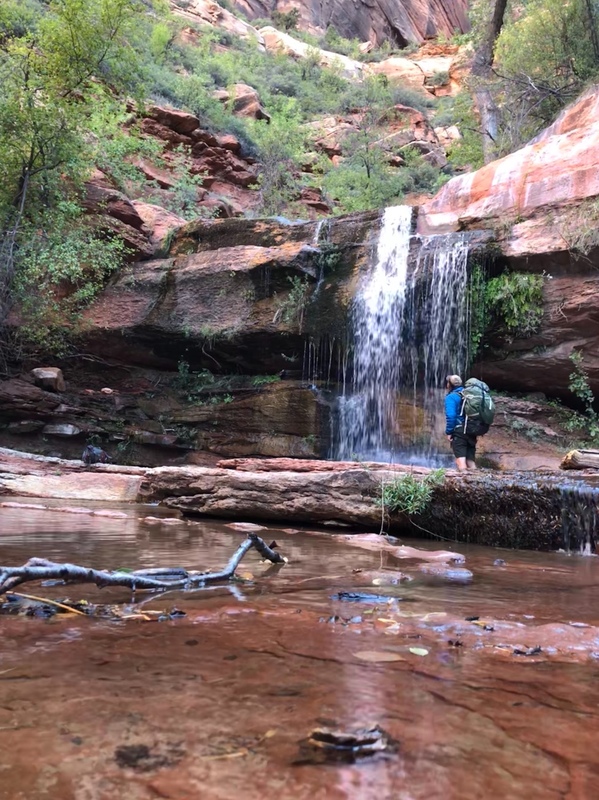 I'll be in Zion next week for the Rendezvous, afterwards I have a week to kill before meeting up with others in Cedar Mesa. I'll have a buddy with me, and I have The Right Fork on the menu. I've done that canyon many times...but bypassing the drop and potholes. There's a spot to drop in about 1/2 hour up from the Black Pool. More like a backpack for us. However, next time I'll just go the same way you did. If I find your rope, I'll let you know. This may or may not happen...we may head to the Grand Canyon instead. I won't be back around here (online) until early October. So you'll have to wait a while for me to let ya know. I've heard that it's still pretty wild and very few folks get in there these days. You might just get lucky! BTW...you didn't bring any pull cord, right? Those three ropes did the trick? I'd read up on it before diving in, of course. Nice report! Indeed, that place is wonderful. And I haven't even done the exciting part yet. Those 3 ropes work well because longest rap is 165 ish. Everything else is less than 100 ft. Thanks for looking for the rope if you go through. Good luck. Thanks for the trip report! Did that one last year and really enjoyed it. Thanks for the reminder of good times.